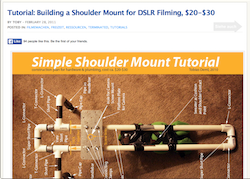 Links to online learning resources for creating your own film gear on the cheap(ish). If you know of any other great learning resources for DIY, please email us and we will add them to the site. A demonstration on building a Menace Arm or pipe boom rig. Made by Adam Olson with equipment provided by MCTC. This $15 crane project was developed on the border to the Mojave Desert while shooting a fake commercial for the Pontiac Firebird. Build a kino-flo style fluorescent soft light with parts from your local DIY store for under $100 and in under three hours! A collection of DIY film gear projects. Join Jeremy as he constructs a DIY Lighting Reflector. The reflective material used in the video is called Silver/Gold Poly. For low-budget filmmakers looking to improve, Indy Mogul has over 1,200 videos full of DIY moviemaking techniques! I have a shoot coming up early next month and I could do with some sort of portable wireless monitor setup, this is what I built. A sight for tips on lighting and creating DIY lighting rigs and rigging. A collection of images of rigging from film sets. Not so much a how to, but a great place to get ideas for what you can create on set. 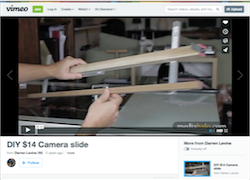 A collection of DIY tutorials from Indie Junkie on Vimeo.